This Lemon Cauliflower Rice Salad with Yogurt Dressing recipe is a healthy, protein-packed and satisfying salad. Serve it as a light lunch on its’ own, as a starter, or a low-carb side for a healthy dinner. How about another cauliflower rice recipe? What Does Cauliflower Rice Taste Like? A while ago, I wrote much about cauliflower rice in this “must try” Dill Cauliflower Rice recipe and I’ve included the easy two-step photos to make it. Basically, if you haven’t made it yet, DO SO! Cauliflower Rice is super healthy, super quick and much easier to make than rice. And the best thing is, that it looks exactly like rice – and tastes even better (if you ask me)! Ok in all seriousness, it tastes very neutral with slight bitter undertones. It has a delicate al dente chew comparable to perfectly cooked rice. There’s no hint of any cauliflower flavor in case you’re skeptical! Plus as soon as you fry it and cook it with oil, garlic, salt, spice and flavor it up, you really get the most of your flavors! Today’s salad has a touch of garlic, some herbs and lemon zest. You’ll get a burst of refreshing flavor with every bite—plenty of lemon and garlic and herbs. 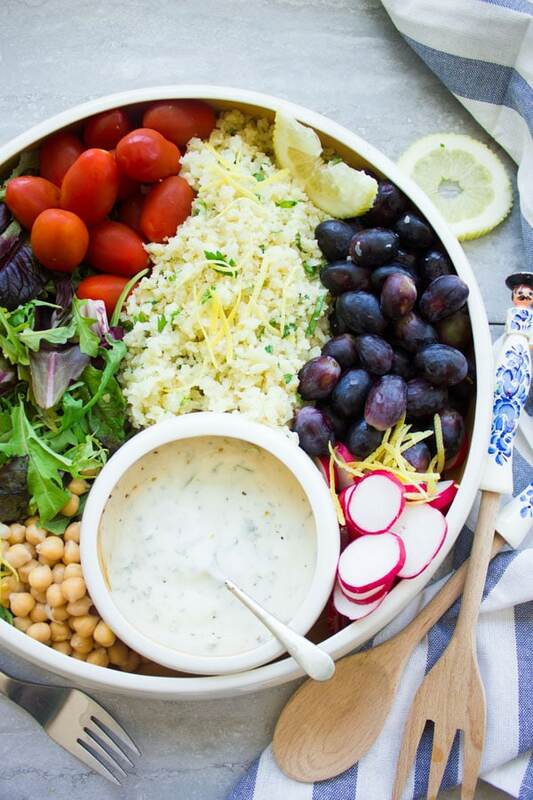 This Lemon Cauliflower Rice Salad with Yogurt Dressing is the perfect light, low-carb meal to beat the heat this summer! Making cauliflower rice is really simple. All it takes are a couple of pulses with the food processor to break down the raw cauliflower into rice-size pieces. The Lemon Cauliflower rice cooks in 7-8 mins max and tastes nothing like cauliflower when you add a touch of garlic to it! Another big bonus of low-carb cauliflower rice is that you can serve it warm as a side for a hearty meal, or cold like in this Lemon Cauliflower Salad with Yogurt Dressing. Start by making the cauliflower rice following this recipe for cauliflower rice. Sautee some minced garlic in olive oil and toss in the cauliflower rice. Add the lemon zest, juice and chopped herbs in the end once the cauliflower rice is cooked completely. Chill the cauliflower rice while you prepare the salad. Gather up the salad ingredients and arrange them on your salad platter. 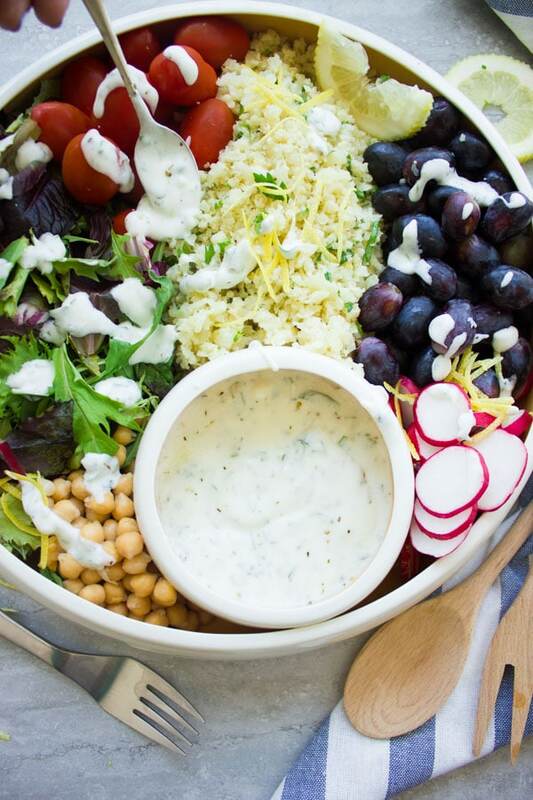 Now, how about some refreshing smooth creamy yogurt herb dressing to brighten up this salad plate? 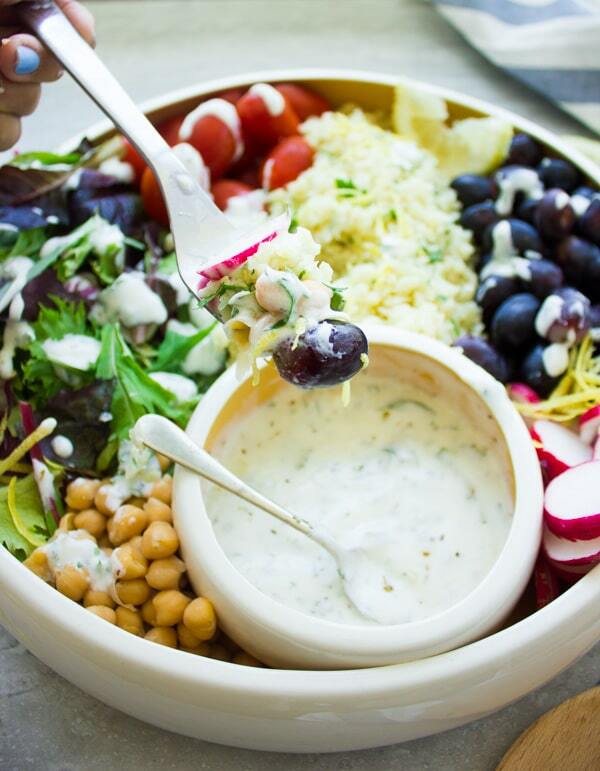 If you’ve been to the Mediterranean, you’ll find many countries there use yogurt in their cooking and add it to dressings, dips, sauces and drinks! Actually one of my favorite is a Turkish yogurt mint drink, which you find in this Turkish Style Chicken Skewers recipe—it’s mainly used there as a cooling drink to balance out the spice and help with digestion. So today we’re using this Yogurt Herb Dressing to balance out the salad flavors and freshen up the palate. Make the creamy, tangy Yogurt Dressing by mixing all ingredients in a small bowl. Thin out the Yogurt Dressing to your taste and drizzle a little bit over the salad, leaving the rest aside. I love pairing this lemony rice with some crunchy radishes, sweet grapes, hearty chickpeas, greens and some juicy tomatoes. Now, this doesn’t mean you can’t throw in some fresh sliced peaches, cucumbers, navy beans, onions, spinach or strawberries! This hearty Lemon Cauliflower Rice Salad is perfect for a potluck, BBQ, family dinners, even for festive holiday meals! Use this recipe for meal prep and fill your kids’ lunch boxes with this healthy low-carb salad. 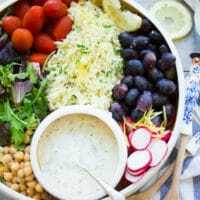 You can easily add your favorite fruits, legumes, cold chopped meats and veggies to this Salad and top everything with the refreshing yogurt herb dressing! Double the recipe for lemon cauliflower rice so you can serve it warm as a low-carb side dish with a nice roast chicken or grilled fish. Put a fruity, summery spin on this Lemon Cauliflower Salad by adding some fresh sliced peaches or strawberries! 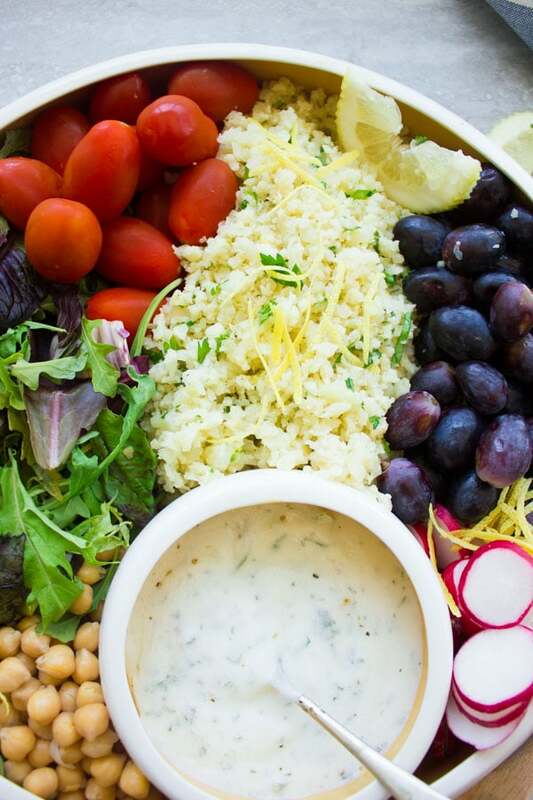 This Lemon Cauliflower Rice Salad with Yogurt Dressing recipe is a healthy, protein-packed, light, and yet satisfying salad. Serve it as a light lunch on its’ own, as a starter, or a low-carb side for a healthy dinner. Prepare the cauliflower rice (see the dill cauliflower rice recipe) by sautéing the garlic in olive oil and adding the cauliflower rice. Add the lemon zest, juice and herbs at the end once the cauliflower rice is cooked completely. Chill the cauliflower rice while you prepare the salad. Make the Yogurt dressing by mixing all ingredients in a small bowl. Thin out the dressing to your taste and drizzle a little bit over the salad, leaving the rest aside. 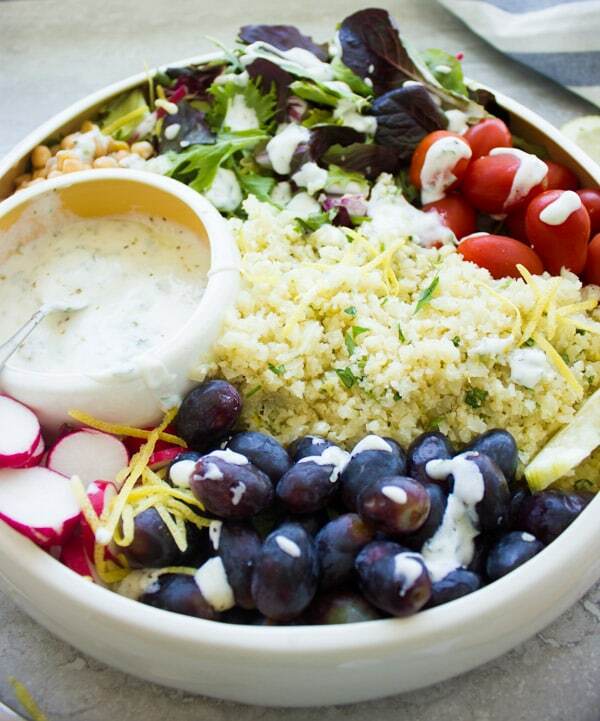 You can easily add your favorite fruits, legumes, cold chopped meats and veggies to this Cauliflower Rice Salad and top everything with the refreshing yogurt herb dressing! Such a great easy healthy idea for a salad. I’m always looking for new ideas to bring to work with me! 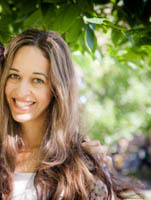 Hope you make this one Danielle! Such great flavor combinations … crunchy, tart, sweet, salty, citrusy … this would be a perfect summer lunch. I think I’ll make one soon … to lift my spirits during the coldest winter days. This is exactly the type of salad you’d find at a restaurant! It is so pretty and the colors are very appealing. I love the vegetables that you use and I’m really wanting to try the cauliflower rice. We like cauliflower so I’m sure that we’d love it in the salad. Yogurt dressing is one of our favorites so I know that it would be the ideal topping to the salad. Thanks Marisa 🙂 I really Love yogurt dressings so much too! I love salads because they are easy to make, packed with flavors and vitamins. I should try your recipe immediately! I think cauliflower rice adds awesome texture to salads. This mix looks lovely! I am also a huge fan of adding grapes to savory salads. Hope you try this one Jenni!